The 7-minute film “Crime of Fashion” will precede the feature film. Directed and produced by Joanne Ha and Sarina Matson while they were high school seniors at Montgomery Blair High School in Silver Spring, Md., “Crime of Fashion” received an honorable mention in the One Earth Young Filmmakers Contest. 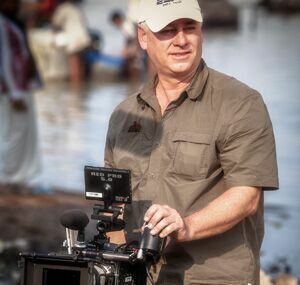 After the film, participate in live video Q&A with Roger Williams, Producer/Director, "RiverBlue". Facilitator: Bob Benenson, FamilyFarmed. Learn about concrete action opportunities and project ideas with: Germaine Curry of Majamas Earth, Rebecca Ratliff and Grace Dobbyn of Citizen's Climate Lobby, Paul Campion of Sunrise Chicago, Nina Newhouser of Sierra Club Chicago, and Luis Magana of FamilyFarmed. There will be a welcome from Bill Reilly of Merrill Lynch/The Reilly Group. *Parking Notice: There will be a Loyola men's basketball game in the Damen Center/Gentile Arena the same night as our film. Given the recent success of the team, the parking garage may fill up quickly. Please try to use public transit or arrive early to allow ample time to park. After the film, participate in Q&A, and learn about concrete action opportunities, with Jeff Spitz, Associate Professor of Cinema + TV Arts at Columbia College; Germaine Curry, Owner/Founder of Majamas Earth; and Carley Ives, Columbia College Fashion minor with Environmental Studies major. Facilitator: Stephanie McCray, Executive Coach at Executive Material. Enjoy a display of upcycled garments from the Columbia College Fashion Department, and engage with an interactive 3D Watershed Model, shared by University of Illinois Extension Master Gardeners. After the film, participate in facilitated audience dialogue to explore the film's topics, connections, and opportunities for action. Facilitator: Wendy Williams, University of Chicago. Also engage with action and project ideas through Peter Gaona of Reformed School.